Anyone can browse the forum without a subscription. Non-subscribers can sign up here and then log in to comment on the forum. 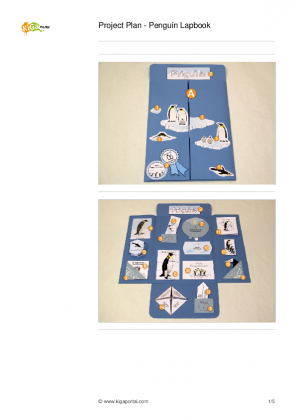 Here you can find all the information you need for creating your penguin lapbook. Seriously,who hosts an activity and doesn't have all of the materials available?? Only certain-a very few- pages of this "lapbook" activity are available??? How am I to provide an adequate lesson on penguins w/ half a lesson??? Granted, it's free but really?? Thank you very much for your comment! The Penguin Lapbook appeared in three parts, and the third part will appear tomorrow. The staggered release dates were planned due to the large number of activities available in the Lapbook. An overview picture of the lapbook, however, was provided upon the release of the first part, for your convenience, so you could see how the final project could/would appear. Please make every effort to ensure a fair and friendly discussion. The editor reserves the right to remove irrelevant, unlawful or morally questionable posts. Note: KiGaPortal assumes no liability for the content of linked web pages in the Forum.